Together with collapsing EPS (down 90% over the past 20 months), the S&P 500 PER has zoomed up to levels last seen in Japan in the 1980's. From 1936 into the late 1980s, the PE ratio tended to peak in the low 20s (red line) and trough somewhere around seven (green line). The price investors were willing to pay for a dollar of earnings increased during the dot-com boom (late 1990s) and the dot-com bust (early 2000s). As a result of the current plunge in earnings and the recent 2.5 month stock market rally, the PE ratio has spiked to the low 120s – a record high. Either the perspective on corporates earnings has to dramatically and quickly improve, or the stock market has to adjust quite sharply; exhuberance cannot last for ever. Two weeks ago we reviewed markets, using the 7 indicators of GTI. Where do we stand today? S&P 500 Banks index: after recovering from the early March lows, the sector is posing. Since the last review the main event was the results of the stress test passed by the 19 banks too big to fail, test results leaked and managed by the authorities so they appear better than expected. Whilst consolidating, still positive. 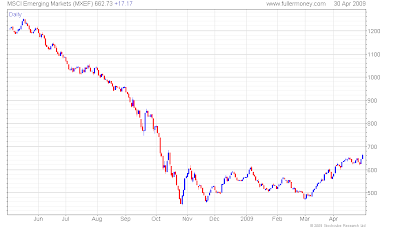 Global 1200 financial index: European banks (which ones?) will also get their stress test which will not be made public. As usual, Europe will not be transparent and rumors will fly. Be ready for more volatility in the sector. Like in the US, the world financial sector is posing. The high reached in November has not been tested as yet: watch it. Still positive. 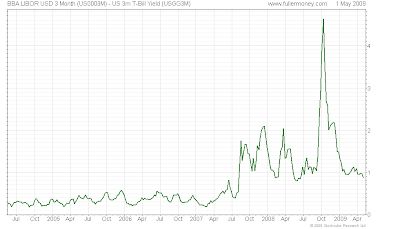 TED spread (LIBOR USD 3 mth - US 3 mth T-bills): Since our last analysis, they have continued to contract rather quickly, going through the June 2007 and May 2008 level. They are now closing on 2006 high. Positive. 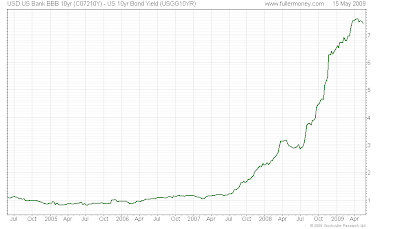 USD bank BBB 10 yr - US 10 yr yield: Not much change. Still much too high and not fully convincing. Slightly positive. 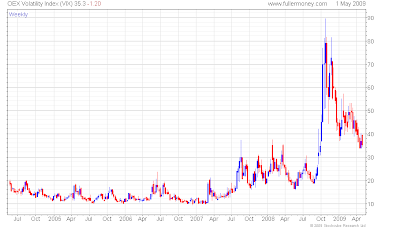 OEX volatility: OEX volatility has decreased further and is entering the testing zone of July2007-July2008 levels; it has to decisively break these peaks. Still positive. S&P Case Shiller house price index: No new data (due late May). However foreclosures are not abating; the real estate market is still distressed whilst confidence among U.S. homebuilders in May increased to the highest level since September. Not bottomed yet hence still negative. Oil price: Oil prices touched $60/b in May before slightly retreating. As soon as the economy shows signs of moving again, oil price will zoom up but still positive. Conclusion: As a whole, the fundamentals still look promising but equity markets not crying buys, particularly with the strong stock market rebound we have witnessed since early March. The S&P 500 is now hovering around 900 and has not breached the January high as yet. It is time to reflect, become more cautious, take some profits off the table and think about the next move. I will review this in a series of articles together with thematic investments. The magnitude of the decline of the 12-month, as-reported S&P 500 earnings is unprecedented (the data goes back to 1936) with 90% over the past 20 months (with over 90% of S&P 500 companies having reported for Q1 2009). Real earnings have dropped to a record low and if current estimates hold, Q3 2009 will see the first 12-month period during which S&P 500 earnings are negative. The big difference with the oil market is its fragmentation and lower transparency; it is why I will only focus on he US market, the most transparent one. Do not dismiss the size of the gas market: it represents approximitely 60% of the oil market (50 mboe/d). At 2.5% per year (1990-2008), the annual growth consumption is twice that of oil. According to IEA and Investec, this growth is expected to continue at the same pace. It is cleaner than oil and coal, and therefore seen as an alternative for the future. From the table, Investec expects the market to be oversupplied in 2009 due to the current economic downturn. This should change in 2010 and 2011 when the full impact of reduced gas production will be felt in 2010 (50% contraction in the number of rigs in 2009) couple to a 50% decrease in CAPEX, according to Investec. Technically, it seems that the low was reached late April, and the upward dynamics on the monthly chart is encouraging and has not been reversed so far. Finally, do not forget the importance of weather, and in particular the hurricane season which starts during the summer. Whilst, like oil, I do not expect a strong price uptick short term, I believe it will however starts earlier and will be stronger than oil. The aggressive investor can position itself on the gas market in the coming weeks. Like for oil, I would however welcome some consolidation. I am convinced that any improvement in the economy will translate into very large price increases for the energy markets, well beyond the consensus. Energy will be back with a vengeance. Global oil supply fell to 83.4 mb/d in March to match diminishing demand; this corresponds to IEA 2009 demand forecast, 2.8 md/d less than in 2008 (see chart). OECD industry stocks rose by 7.5 mb in February to 2,743 mb (7.2% above a year ago) i.e. 61.6 days consumption at the end of February (7.9 days above last year). Investors have started to anticipate the the world economy has reached its trough hence anticipating higher demand along the road. Oil companies have drastically cut into their exploration and development investments. Prices recently have tracked expectations for the global economy, seeking signs of demand recovery. However, pervasively weak market fundamentals could limit further gains until the summer. May 12, oil passed the $60/b mark, the first time since mid-November (oil prices were down awhopping 70% in 2008) to consolidate at $57 today. It is moving towards its 200 day Moving Average (MA) which may check its progression, at least temporarily. After reaching a low of $37.12/b on Feb 19, prices have strongly rebounded with a gain of over 60%. Whilst bearable for consumers (particularly for the non $ based with the current weakness of the $), further advances would act as an additional tax on consumers. North Sea, Mexican and the US production is declining. Russian production which represents 75-80% of non-OPEC' growth is expected to remain flat or even fall due to the lack of investments. Most tar sands production in Canada is marginally profitable (only one project has not been shelved). Remember that oil extracted from tar sands/oil sands represent the largest reserve of oil in the world but is very costly to produce and not environmental friendly. Venezuela with Chavez at the helm of the country is finding it difficult to finance its oil industry. Mature fields are declining faster than expected. According to the IEA, $26 trillion need to be spent by 2030 to meet demand. As of today, there is no way that this amount of money can be found in the coming 20 years. Any pick-up, or perceived pick-up, in the world economy, particularly in China, will boost oil prices well beyond the current levels. OPEC spare capacity coupled with industry stocks will limit a decisive break above the 200 day MA, hence my moderate view for oil prices until the summer. The aggressive investors can however selectively position itself with oil stocks now, which, in addition, are also paying 4-6% dividend yields. Oil stocks underperformed oil and are due to a catch-up. We are in a situation not dissimilar to the early 80's when it was cheaper to buy oil by taking over a competitor than invest in exploration and development; this should therefore lead to strong a M&A activity not dissimilar to the early 80's. I however would personally feel more comfortable when oil is back in the low $50/b. After the inflection point in the early 2000's, the Dow/Gold has entered in a new phase since 2006-07 and the downward tunnel is accelerating. This reflects not only the current financial and economic crisis but also the remonetization of gold in the eyes of investors. European central bankers do not like gold (at the a cost of over $40 billion - see previous post), but they cannot continue acting without noticing this. 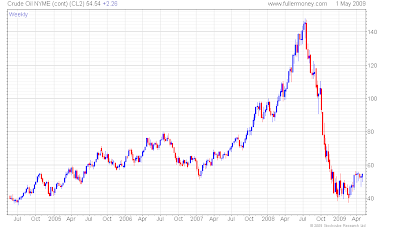 I believe that gold is going to decisively break the $1000/oz by year end. Let's tuned on. I will not talk about all academic studies written on the subject, but more about experience. First point to remember, asset allocation represents approximately 80% of performance, the choice of securities a mere 20%. So focus on asset allocation since this is the only strategic decision to be made, all the rest is tactical. Luxury collectibles such as art, fine wine, automobiles, etc. The following hierarchy of where time MUST be spent in investment management is borrowed from Global Thematic Investors (it is a fee paying newsletter really worth its money), which is, as I am, a great believer in thematic investments. In 2008, only tactical asset allocation was really important: move to cash. In a forthcoming article I will discuss about thematic investments. After the orchestrated leaks over the past weeks on first the methodology and then the banks that may have to raise fresh capital, no surprise: 10 banks out of 19 have are the winners and will need to raise core capital for $74.6 billion to sustain the more adverse scenario (notice not the most...). Under the more adverse scenario (but everybody knows what worst case means after the financial meltdown we witnessed), the 19 banks could lose an additional $599 billion over 2 years vs $834 billion tier 1 capital (and only 50% of this in common capital). I am neither Dr. Doom nor Mr. Boom, and do not know whether the assumptions are too optimistic or not (I however doubt that a central bank can be too gloomy; it has to have an optimistic bias). I only have one comment: today the US hit the 8.9% unemployment threshold in 2009 for the more adverse scenario (release of today unemployment numbers were better than economists' forecasts but in line with the ADP employment report published 2 days ago). And what about banks beyond the 19 too big too fail? The most interesting part of the report is the FED emphasis on core tier 1 capital. Increasingly, supervisory authorities will bear more attention to this, and probably less to all the hybrid capital or quasi-equity. My view is this will be part of a reform (if any) to be enacted by regulatory bodies. This also mean no return to over-leverage in the near future and lower Return On Equity coupled with less volatility for banks in the western hemisphere. I recommend readers interested in the details of the stress tests per bank in a graphical and interactive way to go to the WSJ. "Europe’s central banks are $40bn poorer than they might have been after they followed a British move taken 10 years ago on Thursday to shrink the Bank of England’s gold reserves, analysis by the Financial Times has shown." "European banks sold about 3,800 tonnes of gold, reaping about $56bn." "Taking into account the likely returns from the investments in bonds, the banks have gained another $12bn. But because today’s gold prices are far higher, they are about $40bn poorer than if they had kept their reserves." Interesting enough, the US has not sold any gold. Since, the mid 2000 a number of central banks in Asia (China in particular) and Russia have been gold buyers; a wise move. Once again, central bankers in Europe got it wrong. According to numbers compiled by the World Gold Trade Council, amongst the largest holders of gold, since1999 through March 2009, France (-18%), The Netherlands (-37%), the ECB (-28%), the UK (-51%) and Switzerland (-60%) have been net sellers of 2,988 tonnes, the US, Japan, Germany and Italy held their reserves steady, Russia (+26%) and China (+167%) increased theirs substantially from a low level at +768 tonnes . No need to be a great expert to see where the wise men are located. When velocity will start to roll again coupled with the money created by central banks to face the crisis, the need for many western countries to pay down debt in the least painful way (short term), the sharp increase in metals and energy when the economy revives, you can bet that inflation will jump and gold prices will be ahead. U.S. Initial Jobless Claims fall to three-month Low to 601,000 in the week ended May 2 (-34,000) confirming yesterday's ADP employment report; let's see the payroll report tomorrow. U.S. Productivity Rises 0.8%; Labor Costs Gain 3.3%. ECB cuts rate 0.25% to 1% and and said it would buy euro-denominated bonds (EUR 60 billion) as well as offer longer-term credit to banks. The BoE keeps rates at 0.5% but increased its bond-buying plan by £50 billion ($75.71 billion) to £125 billion. GM posts $6bn loss on sales down 47% (!) during Q1 and a cash burn of $10.2 billion. This brings total losses since 2004 to $88 billion; one may wonder how it survived for so long... Anyway bankruptcy is getting closer by the day with an additional $2.6 billion of tax payer money needed for May. The PMI in the euro-zone continued to contract in April but at a slower pace (41.1 vs 38.3). In the UK the PMI for services also contracted at a lower pace (48.7 vs 45.5). In both cases it was better than expected. Retailing and manufacturing are however getting worse whilst business expectations are back in positive territory (54.4). The employment report from ADP shows that US job losses would have shrunk to 491,000 from the 600,000+ we have been used to over the last couple of months.Let's see on Friday whether the official numbers match these. The Zillow U.S. home value report for 2009 Q1 shows they continued to slide for the ninth consecutive quarter, declining 14.2 percent from a year ago, and falling 21.8 percent since the market peak in 2006, but the pace is slowing down. Additionally, one-fifth (21.9%) of all homeowners in the United States is in negative equity, and one in five homes sold in the past 12 months was a foreclosure. Leaked information on the United States government’s stress tests of 19 major financial companies, lead to depict the situation as not so bad: a handful of banks will need to raise capital ($33.9 billion for BoA, $5-10 billion for Citi, either via new equity, converting existing preferred share -including Government preferred stock- or asset sales) and investors shrugged off concerns about the results of the so-called stress tests. The earnings season is coming to an end and was better than expected, particularly in the banking sector. These numbers, like the ones of the earning season, are bad but not as bad as expected, hence the feel good sentiment for markets. Psychologically, markets are moving from fear to greed. To me, it is an indication that they will correct in the coming weeks. This correction could be sharp, the economic, financial and social environment being still very unstable. Tomorrow's market reaction to details of banks stress-tests and Friday's non-farm payroll numbers will be interesting to follow and may trigger a correction if they are not up to expectations built during the past days and weeks. US debt & budget deficit: I.O.U.S.A. Very interesting and well documented documentary on the sheer size of the US debt and budget deficit, with an historical perspective and the astonishing magnitude of the problem lying ahead. 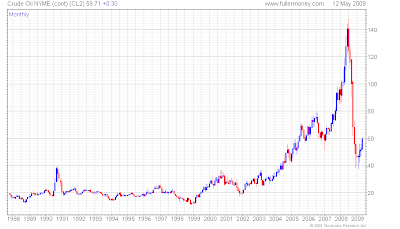 And this is before the sub-prime crisis... Do you really want to hold USD? Markets forging ahead with better than expected home sales in the US and manufacturing in China going up for the first time in 9 months. The market dismissed a sharp downwards revision of the EU forecast for the euro-area economy with a contraction twice as deep as it projected just three months ago at -4%, and the region’s budget deficit will swell to more than double the EU limit. Employment will rise to 11.5%. The S&P 500 finished the day 907.23 (+3.4%), the first time for 4 months it reached the 900 mark, the DJIA 8426.74 (+2.6%) and the NASDAQ 1760.56 (+2.41%). U.S. light crude oil for June delivery rose $1.27 to settle at $54.77 a barrel on the New York Mercantile Exchange. After the UK, the US and Ireland announced income tax increase, the President Obama wants a tax increase on Corporates to raise $210 billion over 10 years by closing tax loophole on profits earned abroad by US corporations. This will be a drop in an ocean of debt and public deficits, but confirms the will of the world largest economy to seriously go after tax havens (not located inside the US however). The train is in motion: not only inflation will be needed to pay the huge debt most western countries are taking but tax increase will be the rule to pay it down. Reaganomics and Thatcherism are dead for the time being. After a 2 month rally what steam is ahead? In their newsletter, Global Thematic Investors (GTI), Bruce Albrecht and Iain Little designed 7 key indicators technical and behavioral, mainly centered around the financial sector that is at the root of the current crisis. Other indicators cannot be dismissed, like money supply, the USD/EUR rate, etc., but these will be key to pinpoint any recovery. Let's review these 7 indicators. 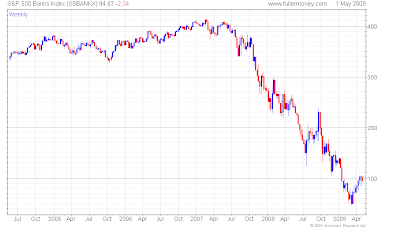 S&P 500 Banks index: problems started with the US banking sector and will end with it. 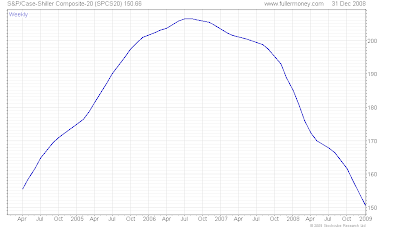 The index bottomed out in March and is now posing. Positive. 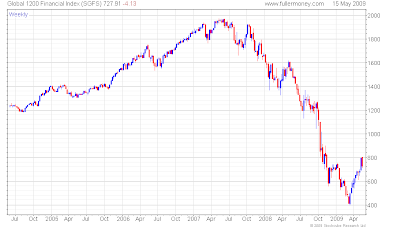 Global 1200 financial index: This is a good proxy to the world banking system. 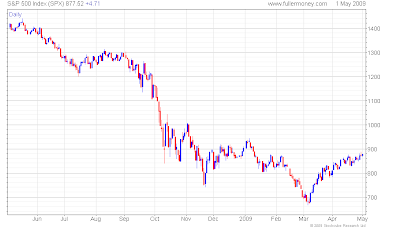 It has also bottomed out in March and is now consolidating. Positive. TED spread (LIBOR USD 3 mth - US 3 mth T-bills): The trust in the financial system has come back with TED spread sharply down from the October/November panic. 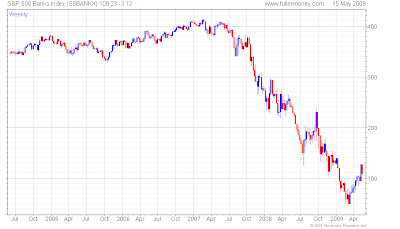 After hovering around, 1% it is now falling below it and will soon test the June 2007 and May 2008 level. Positive. 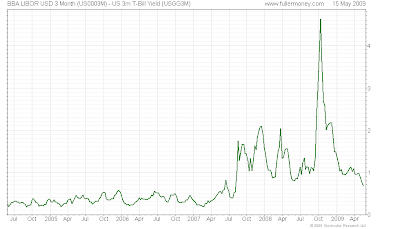 USD US bank BBB 10 yr - US 10 yr yield): The stress in the US financial sector is still high but topping. Still much too high and not fully convincing. Slightly positive. 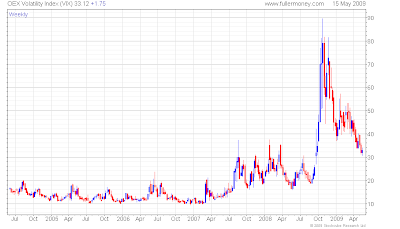 OEX volatility: Confidence is slowly coming back with OEX volatility well below its peak. 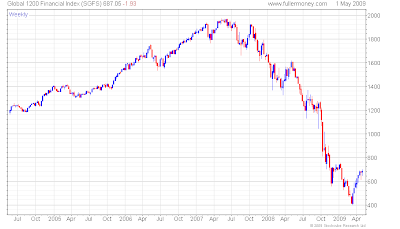 It still needs to decrease further and will soon test July2007-July2008 levels; it has to break these peaks. Middly positive. S&P Case Shiller house price index: Due to its relationship with the financial crisis and the broader economy, it will be key to a sustainable recovery. The housing market still falling (143.17 in February) but at a lower pace than previously. Not bottom yet however hence still negative. Oil price: Low oil price is adding consumer purchase power. 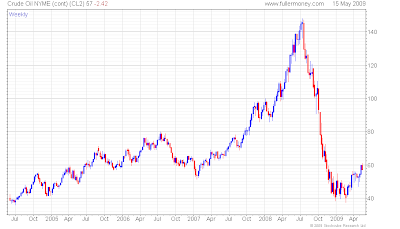 Oil prices have bottom out late 2008 early 2009 and moved up to hover round $50/b. As soon as the economy shows signs of moving again, oil price will zoom up but still positive. As a whole, the fundamentals look much more promising than 2 months ago. My belief is that we witnessed the bottom in November last year, but will see the market consolidating rather soon for a couple of weeks/months after a very good rally. Cash is no longer king. It is time to look at markets and where to invest. I will review this in a forthcoming article. Equity markets: where do we stand now? 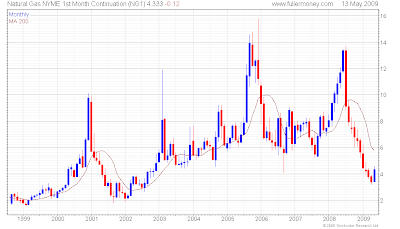 A quick glance at some charts show that the low seems to have been reached in October and November 2008. Markets with the best fundamentals (i.e. Asia and emerging markets as whole except in Europe) have since rebounded sharply (+32% since the low of March 6 for the S&P500 and +49% for the MSCI Emerging Markets index since the low of October 28); the new low reached by developed markets in February 2009 (to the exception of Japan which followed the Asian market pattern) reflects the uncertainty surrounding the financial sector, particularly in the US, and worse global fundamentals (deficits, public and private debt, demographics, economy). Since, the path to recovery seems to have been cleared. Backward looking indicators are still negative (unemployment for example) and forward looking ones more positive (consumer confidence for example). It also became evident that the US will nationalize (or whatever you call it) banks if needed by exchanging TARP loans for equity. Investors are now looking forward and beyond 2009 that will be awful, and slowly moving their psychology from the half empty to the half full glass. Markets are also telling us that whilst the US leash effect on world markets still exists, emerging markets, and China in particular, are leading the recovery. In the next article, I will review a number of indicators in order to analyze whether this is a bear market rally or a the real recovery.